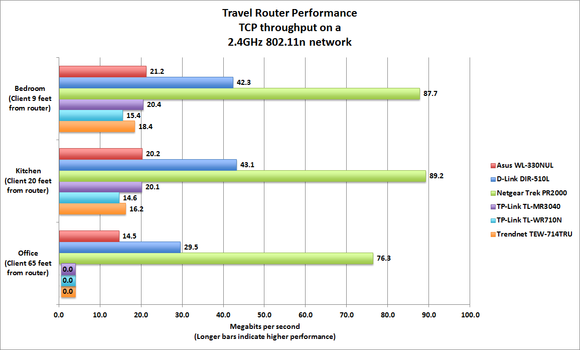 Netgear’s PR2000 Trek travel router finished first in both range and throughput. It doesn’t have as many features as some of its competitors, but it is well designed and is largely self-contained. You’ll never need to worry about packing an AC adapter, because it’s built in—just swing its blades down and plug it into a nearby socket. If you want better range than what you’ll get from operating the router near the floor, you can plug a USB AC adapter into its micro USB port (but you’ll need to provide your own, since Netgear doesn’t put one in the box). You could also connect an external battery to the Trek’s micro USB port (here again, you’ll need to provide your own). When you’re at home, you can configure the Trek as a wireless range extender. The Trek operates only on the 2.4GHz frequency band, supporting the 802.11b/g/n standards, but it supports two spatial streams in 802.11n mode to deliver maximum throughput of 300Mbps (most of its 802.11b/g/n competitors support only one spatial stream and therefore top out at 150Mbps). That and the aid of an articulated antenna helped the Trek deliver very high throughput—76.3Mbps—when the client was in my home office, 65 feet from the router and separated by several walls. That's more than three times faster than two of the other routers I tested, and the other three couldn’t reach the client at all. With the client at close range—nine feet from the router and in the same room—the Trek delivered TCP throughput of 87.7Mbps, and the Trek's performance actually ticked up slightly when I moved the MacBook Pro to the kitchen, 20 feet from the router and separated by one insulated wall. 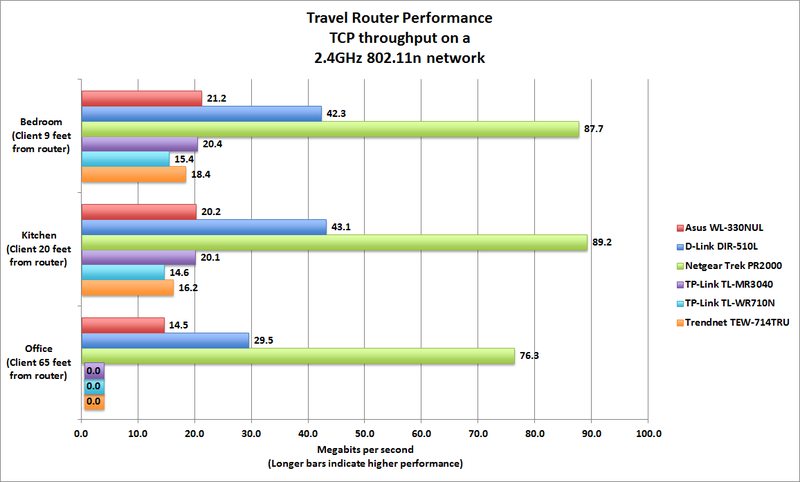 Netgear's Trek PR2000 was the fastest travel router we tested, and its range was much better than any of its competitors. Pivoting the antenna upward—as I did for my tests—exposes four LEDs that light up to report power status, Internet access, Wi-Fi activity, and the presence of a USB storage device. It’s always nice to have visual affirmation instead of having to guess what’s going on. 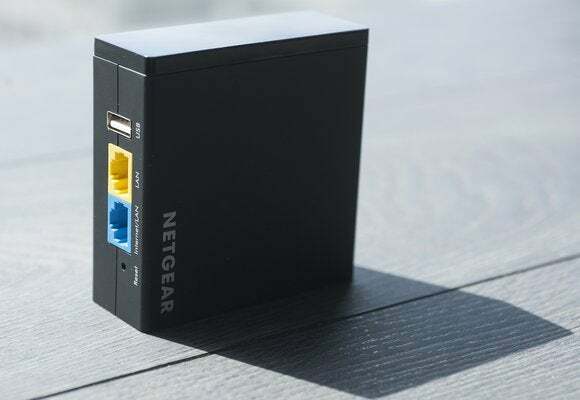 Netgear’s travel router has two ethernet ports, so you can connect one to a DSL modem, cable modem, or the ethernet connection in your hotel room, and support one wired network client with the other (or plug in a switch and support as many hardwired clients as the switch has ports). The Trek does not support a guest network, which means anyone who's granted access to your network will be able see all the other devices on your network—you can’t restrict them to just Internet access. You can also connect the Trek to a Wi-Fi hotspot and share a broadband connection that way. A WPS button would be a welcome addition in these scenarios; as it stands, you need either to log into the router’s user interface to initiate WPS pairing, or read the factory-assigned SSID and Wi-Fi password that’s printed on the router itself (assuming you didn’t change it). This is a minor inconvenience, but an inconvenience nonetheless. When you’re at home, you can configure the Trek as a wireless range extender to fill in dead spots, or as a wireless bridge to support clients such as older Smart TVs, Blu-ray players, or AV receivers that require a hardwired network connection. Just don’t forget to take it with you when you hit the road again. The Trek has one USB 2.0 Type A port that can be used to share a portable hard drive over your network. I much prefer Netgear’s Readyshare software for sharing files on a USB hard drive attached to the router. Using an SMB server, you can easily copy multiple files or entire folders over your network. The Trek also has an FTP server for sharing large files over the network or over the Internet. You can also use that USB port to charge another USB device, such as a smartphone or media player—when the router is plugged into power. Unlike the D-Link and TP-Link devices, however, the Trek does not support USB cellular modems (although Netgear’s website indicates that the model sold in China and Russia does). The Netgear Trek supports UPnP, but it doesn’t have a DLNA-certified media server. If you consider media streaming a critical feature, you might be happier with D-Link’s DIR-510L. But I don’t imagine that particular feature will be all that important to someone shopping for a travel router. The Netgear Trek is extremely versatile and it delivers great speed and range, but it operates only on the 2.4GHz frequency band.